Do you think that memory work is important but don't have time to pull it all together?? I'm so excited to share this resource with you! I will be sharing a POEM, a HYMN, and a SCRIPTURE VERSE for each month all fitting with an appropriate theme for that month! Printable of Poem ~ you can hang this in your school room, frame it for the month, hang it on your fridge, wherever you and your children can see it to practice it! 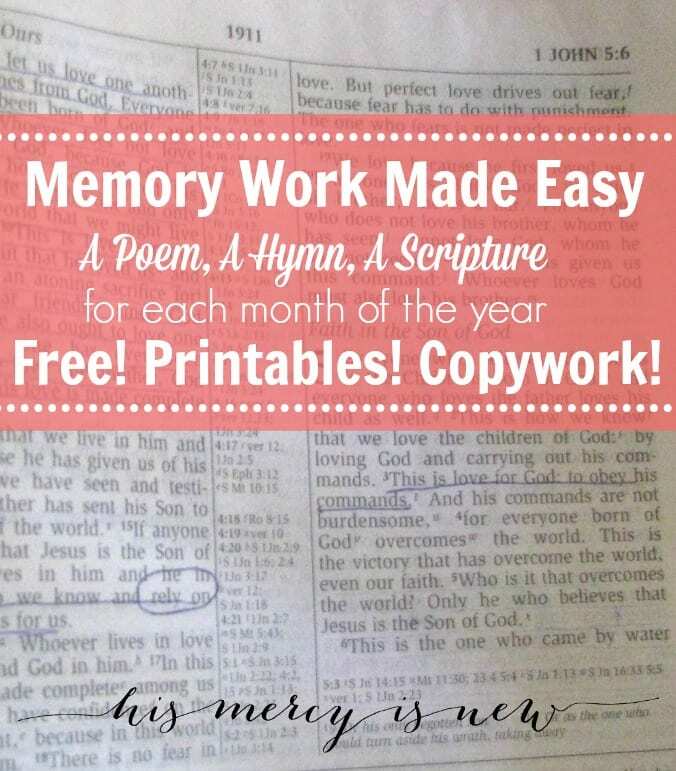 Copywork of Scripture verse ~ you can print this out multiple times for each child or once or however you choose to use it! I have print and cursive on one page! Youtube videos ~ I share multiple videos of each poem and each hymn. In our home, we listen to a different version each day. I think it's good for my kids to hear the contemporary AND the traditional hymns. I want my kids to know the hymns I grew up on. I think it's good for them to also hear others reading these famous poems. A link to a site online where you can print the PDF or sheet music for each hymn. Memory work has been very important in our homeschool. We have memorized Scripture, memorized poems, memorized lots of things! You can read all the studies showing how important memory work is, but I hope that by actually TRYING it you will see the benefits for yourself! Why memorize?? "I have hidden your word in my heart that I might not sin against you." Psalm 119:11. Memorizing Scripture is amazing for our hearts and the hearts of our children. Scripture memory is also one of the tools I use to fight depression. But it is also good work for our brains! Click over to read more memory work posts from my blog, including some fabulous guest posts on the topic! How we use this resource in our home: We start our day with memory work. Often, while the kids are doing their chores, I play through several versions of the hymn. When we begin our day, we recite several Scripture verses we've been working on, the current verse we do daily through that month. Usually once a week we review older hymns, poems and verses. We listen to one version of the poem and hymn. And usually we also recite the poem and verses on our own, without the videos. At the beginning of the month, the kids repeat after me one line at a time. As we move toward the second half of the month, we all say it together. For several months now we've been memorizing a poem and a hymn that go with a monthly "theme." For January, we learned the hymn Whiter Than Snow and we memorized Stopping By Woods on a Snowy Evening for our poem. In sharing this with others, it seemed that sharing this resource would be beneficial for some of you! So, here we go! Free Memory Work for One Year! Click on each square below to see the resources for that month!